The fall bug has hit the pages of These Conversations Kill for another year. This being the first time that I’ve done a seasonal scene in 2017 but I wanted to make sure I got this in before any other weather started to take over. I’d had this idea formulated in my head since last year but the time just rolled by me and it became too late in my mind to try and put it together. After waiting a year I finally was able to get it off of my list of ideas and into virtual reality photography. The honest truth is I think it turned out better than I expected because not every bit of the look I chose for this was around at that time. Much of these items being recent releases as of the last month or two. Some of them even just having come out. As the Thanksgiving Holiday approaches many families will get together and go out into their yards or a nearby park and play a little catch or touch football. I thought I would try capturing that feeling with the pose set that I am using. I think all of the items I pulled together to create this made the feeling a little magical as I was taking the photos and listening to the song that inspired me to do the session in the first place. Once again I was on location and revisited a place where I’d done photos at before but it was a while ago and I do not recall it having a fall theme to it. The Mill is a very photogenic spot and a great place to explore even if you are not a photographer. It’s a very peaceful place and right now it is a very fall-centric spot for those of you who enjoy beautiful colors of autumn. MESANGE has given me the privilege of featuring the “Solunis Eyes” for this entry as they are a part of the list of designer’s that feel I am worthy enough to review their products. These eyes are certainly very colorful and I’ll give more of my thoughts on them in the style credits below. The eyes are a part of the Hipster Men’s Event which I’ve also had the pleasure of taking a stroll through the current November round. 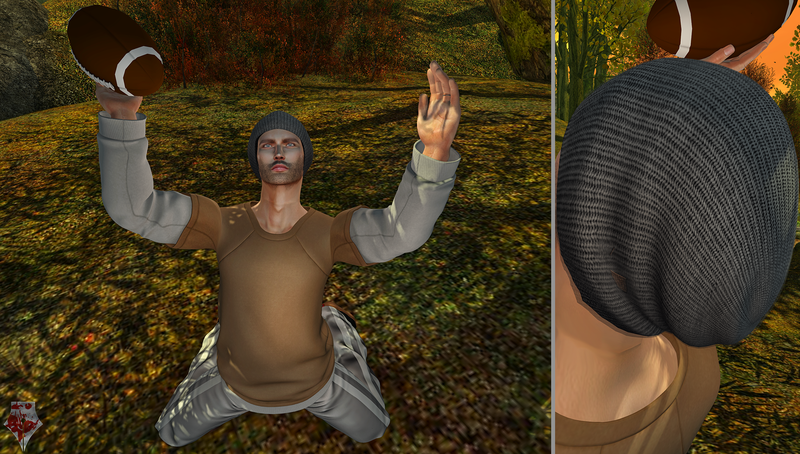 Lots of great poses, clothing, and accessories to be had, one of which is the FABIA “Rich” Hair/Beanie combination. With the weather becoming more chilly, wearing a hat like this would certainly keep a person comfortable. I hope you’ve found something you’re interested in checking out for yourself while browsing this post. There’s plenty of shopping to be done and a lot of great events currently running and I will be looking to give you coverage on them as well in upcoming installments of this blog. Thank you for sharing in this adventure with me it’s been a lot of fun. Stay true to yourself and I look forward to the next adventure. I’m sure you’re likely wondering why I would list this item as hair when in the photos you clearly see that it is just a beanie. Well my friends this is more than just a beanie, there are three versions of this beanie (the one you see in these photos and two others with different hair lengths). I may actually wear this again to show you one of the other versions. I purchased the FATPACK which for the amount of colors you get is worth the price tag if you are someone like me who doesn’t always stay with the same hair color all the time. There are 5 different color packs if you decide not to get them all and they all come with the 3 styles of beanie and a HUD to change the color of the beanie. Previously released at an event, this shirt (well honestly I’d call it more of a shirt with a sweatshirt underneath) has a lot of different color options. I purchased the FATPACK which comes with a HUD that allows you to color both of the shirt and the sweatshirt. This is definitely perfect for those people who aren’t quite ready to bring the winter coats out of the closet. COMPATIBLE With: Belleza, NX-Nardcotix, Signature, SLink and TMP male bodies. I previously have worn these shoes before in other blogs but I wanted to state that they have been updated to fit the Belleza male body. They are really awesome low-top sneakers and honestly one of my favorite kinds to be released in the past year as they resemble some that I own in the real world. COMPATIBLE With: Belleza, Signature, SLink and Classic male bodies. This pose set comes with 6 different action poses depicting the game of American football. While they are really meant to be used in a setting with where there is a real field and uniformed players, I managed to make them work for the idea that I envisioned when putting this scene together. I think they can definitely also be used for other types of football photos as well. Excellently made but to give a brief warning, they are not Bento enabled as they were created before it was released.